The giCentre strikes again this year, after winning the VAST Best Poster in 2016, and the InfoVis Best Poster in 2017. We are delighted to announce that our poster Conveying uncertainty in archived war diaries with GeoBlobs has been awarded the IEEE InfoVis Best Poster 2018. In collaboration with The National Archives we explored options to visualize uncertainty in troop movement data derived from handwritten first word war UK military diaries. Come and see us in Berlin during the poster session on Wednesday evening. Meanwhile have a look at the poster abstract and a draft of the design. An interactive prototype will be on display during the opening event of the VIS Arts Program on Tuesday evening. We, Eirini Goudarouli, Steven Hirschorn (both with The National Archives), Johannes Liem, Jo Wood (both with the giCentre) and Charles Perin (with the giCentre and the University of Victoria) would like to thank the reviewers and InfoVis poster chairs. Our paper on Literate Visualization was awarded an Honorable Mention at IEEE VIS. We'll be presenting the work at InfoVis in Berlin. 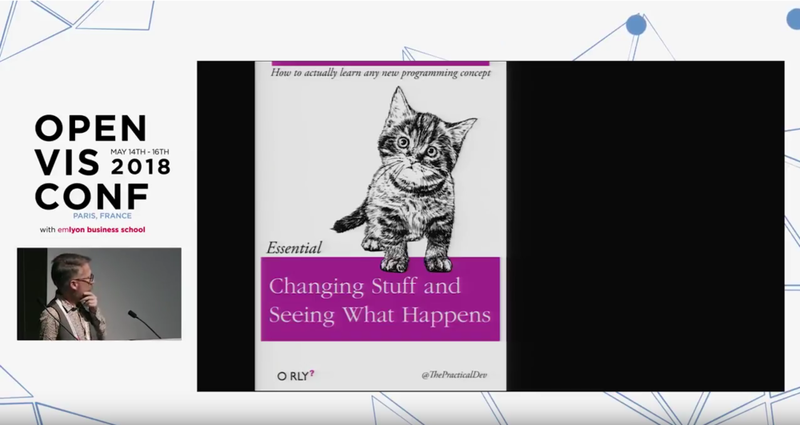 Jo Wood's OpenVisConf talk is now available on YouTube - along with many other useful talks from the conference held in Paris this summer. In Why Not How! Telling Visualization Design Stories Jo justifies and introduces an approach to Literate Visualization developed at the giCentre.